As the in-world time folds toward a significant event in a story I’m writing, I want the reader to anticipate the sharp moment of the event. Like a hand fan closing, the story needs to move toward that snap. In a larger sense, the story is moving toward a climax, but readers won’t be able predict the climax so early on, if I’m doing my job right. It’s the end of Act I. Our Heroine will experience a change in her understanding that sets her up for Act II. I find myself thinking about how fun it is to enjoy a story where you feel carried along on a clear path, but you are enjoying the ride enough not to look ahead and speculate — at least, not overmuch. It can be disappointing to guess the ending. It’s even more disappointing when the ending is a mismatch for the ending that seemed to be coming. Anticipation is a good tool for managing audience expectation. It has the benefit of creating a fun kind of tension, like knowing of an upcoming vacation. A few years ago, a study by researchers in the Netherlands showed that the anticipation of a vacation increased people’s happiness greater than the vacation itself. Readers have two kinds of anticipation. They can look forward to the opportunity to read the book (because who gets the time or has the stamina to read something straight through, beginning to end? ), and they can carry hopes for what will happen in the story. Pacing in a written work is different from the pacing of a movie or television show, where the pacing is part of the real time it takes to show the story visually. In written work, the reader participates in pacing by reading speed and time to read, which affects the pacing in the narrative structure. The writer can’t control when the reader has to stop; the writer can only make it hard for the reader to put the story down. If the story is a retelling, part of a series, a licensed world, or a fanfiction, then the raw elements “package” includes items that the reader wants and expects. A good story of this type uses familiarity to carry the reader along. For example, Sherlock Holmes fans wonder how the latest incarnation of Holmes will address the role of Doctor John Watson; the nemesis, Professor Moriarty; the one woman who outsmarted Holmes, Irene Adler; and the “death” of Holmes at Reichenbach Falls. Whether or not Holmes’s use of “the seven percent solution,” his disguises, or the Baker Street Irregulars are included seem to be lesser elements that may or may not be utilized. Sure, the story has to have original elements to keep it from being a boring rehash of the original work, but if the new story doesn’t have familiar characters, story points, and/or world elements addressed in some way, the reader is going to feel anxious when they don’t appear and will feel cheated by the end. An original work gets to create that waiting-for-the-last-day-of-senior-year feeling more freely, but all stories still have a toolbox from which to draw. The template of the genre provides some. The story may draw on tropes with a wink at the savvy reader. In my opinion, a good story uses multiple elements to create that good tension, and the most important one is that it develops the secondary characters as fully as the main character, through the series of interactions that happen throughout the story. Good characters carry a story. This sounds like writing 101, and it is, and here’s why: looking forward to a vacation get-away is happiness-increasing anticipation, but looking forward to a vacation with someone you love to be with is twice as good. If your readers want to spend time with your characters, they will look forward to the next opportunity, whether that’s the next chapter or the next book. I’ve started doing a thing when I write a draft. 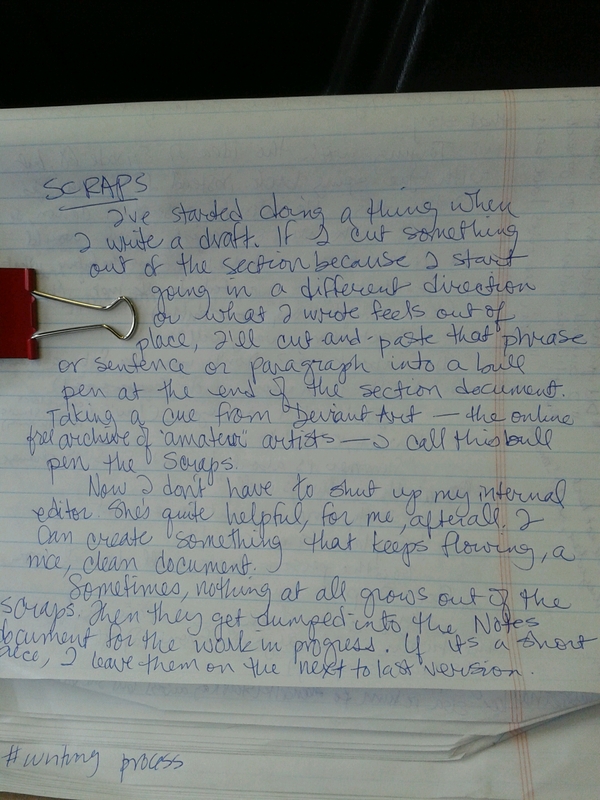 If I cut something out of the section because I start going in a different direction or what I wrote feels out of place, I’ll cut-and-paste that phrase or sentence or paragraph into a bull pen at the end of the section document. Taking a cue from Deviant Art — the online free archive of “amateur” artists — I call this bull pen the Scraps. Now I don’t have to shut up my internal editor. She’s quite helpful, for me, after all. I can create something that keeps flowing, a nice, clean document. Sometimes, nothing at all grows out of the Scraps. Then they get dumped into the Notes document for the work in progress. If it’s a short piece, I leave them on the next-to-last-version. You are currently browsing entries tagged with writing process at Cris de Borja.